We're about two-thirds into the conference season, and there's still a lot we don't really know about this conference. For starters, which team is the Big Ten's best? Will the Big Ten get 7 teams into the Dance? 6? 5? Stone has checked all of those boxes with aplomb, and the only real "surprise" is that he's shown no symptoms of careless ballhandling, or off-ball offensive fouls, that typically pump up freshman post player turnover numbers. Unless Stone is drafted by the Wizards, I doubt local Maryland fans will get to see him in person much more after this season. I feel like Davis has received relatively little publicity relative to his production. Maybe it's because he's pretty well-locked into a semi-starting timeshare within Tom Izzo's stable of big men, but that's more a reflection on how well Matt Costello has played. (Seriously, Costello has gone supernova in conference play: large share of the offense, the Big Ten's best rebounder, 55% shooter, and a strong candidate for the best defensive player in the Big Ten). Davis has been compared to former Spartan Adreian Payne, but—no offense to Payne—Davis is much better at the same stage. Payne never converted over 60 percent of his 2s, and he was never an elite rim protector like Payne. With Costello and Davis, Izzo has an embarrassment of riches in the post (they're pretty good on the perimeter, too...how does this team have 5 conference losses again?). But he might be without both players next season. Mind you, there's absolutely nothing wrong with that. Bryant is the perfect big man for Tom Crean's offense, with its attacks at the rim and kick-outs for 3-pointers. Will the scouts love Bryant's one-dimensional game on offense? Maybe not, but there's plenty to build on here. 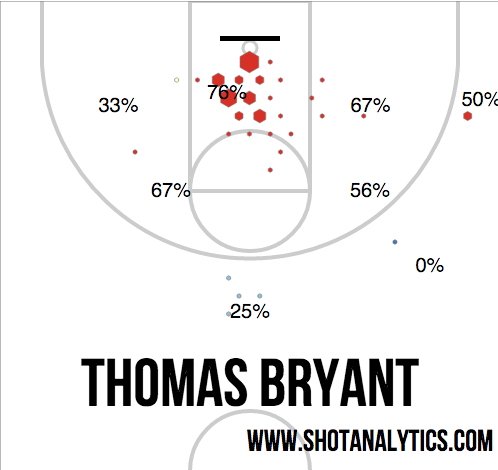 Bryant shows some willingness to attempt 3s, suggesting he's got some shooting ability. He also excels at getting to the line, rebounding, and he's at least a capable defender. Where he struggles is typical with freshmen centers—too many turnovers and too much fouling. There's plenty of upside here, and it would not shock me if he were a Big Ten Player of the Year candidate in 2017. ** Yeah, that's right. Rutgers. How's that for a Hot Take? Sure, Sanders' efficiency isn't where you want it (95.2 in conference play), but his usage is sky-high (30.6 percent of Rutgers' possessions) and he's clearly the primary (sole?) focus of opposing defenses. He's the team's best point guard, defender, scorer, shooter, and possibly coach. Were Sanders playing for Duke, he would be shooting 40 percent from 3 with some fantastic assist numbers. Look at it this way—Sanders has the 5th-highest assist rate in the Big Ten, and that's while relying on his teammates to make shots after he passes them the ball. And his teammates play for Rutgers. All of this highlights the very real possibility that Sanders transfers after the season. While I'd love for him to stay in the Big Ten, it's probably best for Sanders if he goes elsewhere to finish his career. Rutgers will never make the NCAA Tournament while he's in school, and he may never avoid concentrated defensive attention playing for the Scarlet Knights. And there's already been some rough patches. Sanders hails from Florida so there's no hometown affinity to New Jersey. Thus I would not be shocked to see him finish his career in someplace like the ACC. Keeping Sanders in town might be Eddie Jordan's biggest priority this offseason. ** Happ is a redshirt freshman, but a freshman nonetheless. His game is solid across the board, and he excels at rebounding and post moves, particularly around the baseline. Happ does have a weakness, however—he's an awful jumpshooter. According to hoop-math.com, Happ has made just 4 of his 26 two-point jump shot attempts on the season, and he's yet to attempt a three-pointer. Now, even if Happ just marginally improves his game without developing a jumpshot, he would be a pretty good player. But it's worth noting that Nigel Hayes never attempted a 3 as a freshman, either. Josh Gasser made 30 percent of his 3s as a freshman, but was a career 40 percent outside shooter. Sure, some guys like Ryan Evans or Greg Stiemsma never developed much of jump shot, but that tends to be the exception in Madison, not the rule. Of course, now there's a different coach roaming the sidelines, so Happ will make for an interesting test case. ** Lyle's had a very up-and-down season thus far. He opened the season as the team's starting point guard, had a rough December, and then after scoring 45 points in two Big Ten games, he scored 20 points over his next 5, losing his starting spot in the process. Since then, he's scored 43 points over his last two games. In short, you don't know what Lyle is going to give you on any given night. He's not a very good outside shooter at this stage (27% on 3s for the season) and his decisionmaking as a point guard is very much freshmen-esque. But he's a great passer, draws fouls, and his size and athleticism allow him to convert on 52 percent of his 2s in conference play. Coleman-Lands deserves to be on this list because of his 40 percent three-point shooting, but that's all he does. He's a poor defender. He's made just 36 percent of his 2s on the year. He has 8 assists in conference play. He's made 12 free throws in conference play. And to confirm that he's not really creating shots for himself, he has just 5 turnovers in conference play. Turnovers are bad, but any player that is counted on to create shots for himself or for his teammates will necessarily accumulate turnovers. The fact that Coleman-Lands is not doing so evinces his lack of playmaking ability. Frankly, from an upside standpoint, I'd rather have the player with lots of turnovers than the player with none. Better to have someone who thinks they can make something happen than the guy who knows there's no point in trying. The Indiana native was a highly-touted recruit coming out of high school, so a large sophomore leap should surprise no one. But for that, I would say that JCL has largely maxed out his abilities. It's not like he's going to shoot 50 percent from 3. **Throughout his tenure at Nebraska, Tim Miles has struggled to find an adequate point guard. He tried Benny Parker. He tried Deverell Biggs. He's tried Tai Webster and Tarin Smith. Biggs probably came the closest to adequate, but he was dismissed from the program. Well, Miles needs to search no further, as Illinois native Glynn Watson has come to the rescue. Demetri McCamey's brother doesn't share his last name, nor his game. Even at this stage, McCamey was a superior shooter, though the taller McCamey was oddly a worse two-point shooter as a freshman. McCamey went on to excel on the offensive end, but he was never much of a defensive presence. In contrast, Watson sports one of the Big Ten's best steal rates. As a 75 percent free throw shooter, I expect Watson's outside shot to come around. I don't know if the assists will ever reach the levels of his older brother, but that might just be Tim Miles' Ballhog Offense at play (Miles' offense is much more reliant on dribble penetration than most, which tends to lower assist rates). But thanks to Watson, point guard is no longer a concern for Nebraska, and it might be paying dividends in lots of ways. Webster, for his part, is flourishing in his role as an off-guard. **Alex Olah is an underrated center that Northwestern would be unable to replace, were it not for Pardon. In conference play, Pardon has made 66 percent of his 2s while rebounding at a high level, eschewing turnovers, and getting to the free throw line with regularity. This is Northwestern, not Kentucky, so suffice to say that a center that can do all of those things—a freshman, to boot—is a near-mythical beast. So why was Pardon relegated to the role of "bench cheerleader" for Northwestern's first 12 games, while Joey Van Zegeren and Gavin Skelly played with regularity? Science may never know the answer to that, but regardless, the trio of Pardon, Bryant McIntosh, and Aaron Falzon are a good bet to take Northwestern to the Dance at some point in their careers (though probably not this season). **Murphy is an undersized (by height, at least) power forward, and I wonder if that fact affects his game. I don't mean in the conventional sense—Murphy has made 58 percent of his 2s in conference play, so his height doesn't seem to be a problem there. But Murphy is a poor shooter (22 percent of his two-point jumpshots, 60 percent free throw shooter) that has nonetheless attempted 26 three-pointers on the season (making 7). Murphy's a great rebounder, capable defender, and excellent post scorer. He doesn't need to attempt three-pointers. He should take a page from Jae'Sean Tate and not worry about how tall he is, and make outside shooting an offseason project. What's up with Maryland's offense?